A healthy economy is rooted in access to family-wage jobs. Which is why, for the last decade, we’ve closely tracked our region’s economic health through an annual Value of Jobs Economic Check-Up, and why we are starting our step to better understand policy opportunities for a more equitable economy in East Multnomah County. Our annual report closely tracks indicators across our region such as median household income, educational attainment, industry growth and housing supply to help us understand economic benchmarks regionally. The data this year show that despite some slowing, the overall economic health of the Portland region remains strong. Personal income surpassed the U.S. metro average for the first time since we began this report in 2010. Additionally, our region’s residents are becoming more educated, and we lead the pack, along with Seattle, in exports as a share of gross domestic product. But disparity is growing. We continue to face challenges with affordable-housing supply, resulting in longer commute times and geographic displacement across the region. New this year is a closer look at the challenges and opportunities for attracting and retaining jobs in East Multnomah County (which, for the purposes of this report, is defined as east of Interstate 205). We chose to focus on what’s happening for those who live and work in this area because we know that appropriate research is the first step in the journey toward good public policy. Our report reveals that there are nearly 100,000 jobs in East Multnomah County, indicating the area is its own economic engine and a significant contributor to Portland’s overall economic vitality. Most of the jobs in East Multnomah County aren't going to people who live there. However, of the nearly 100,000 jobs, virtually all industry sectors have lower average wages per employee in East Multnomah County than they do west of Interstate 205. For example, in the health care industry, average wages are roughly $10,000 lower than for the rest of the Portland region. This discrepancy in the health care and social-assistance industry is probably due to the fact that jobs in East Multnomah County are more likely to be in smaller clinics or rehabilitation services where wages are lower than at the larger hospitals west of I-205. In management of companies, East Multnomah County jobs pay almost $70,000 less than those same jobs in western Washington County, where investments in infrastructure have been prioritized to accommodate larger companies. While a specific solution to this problem is elusive, this statistic underscores the need for continued efforts to promote wage gains at all skill levels across the region. Also importantly, as East Multnomah County diversifies more rapidly than the rest of the region, the impacts of wage disparity on communities of color become more pronounced. Additionally, most of the jobs in East Multnomah County aren’t going to people who live there. More workers commute into East Multnomah County (67%) than West Multnomah County (44%). And 69% of residents in East Multnomah County commute outside the area for work. Of course, this high share of workers commuting in and out of the area each day adds strain to an infrastructure system in need of significant investment. A lack of affordable transportation options and lengthening commutes are an inequitable burden on families living in East Multnomah County. Increasing the percentage of residents who work where they live and improving how they get around must be a clear objective. Simply put, residents in East Multnomah County are not benefiting as proportionately from Portland’s robust economy as the rest of the region. Those living in East Multnomah County continue to be the most at risk of displacement and are less likely to find family-wage jobs close to home. A closer look at the data shows specific indicators that require collaborative action from business, elected leaders and residents to help solve the problem. The Portland Business Alliance intends to move forward with residents and policymakers to improve access to good family-wage jobs in East Multnomah County. This year’s Value of Jobs report reveals two concrete areas for collaboration and policy innovation. First, we must work toward a healthier balance of 50% of those who work in East Multnomah County living nearby. Second, we must do what we can to directly improve access to family-wage jobs in East Multnomah County. By collaborating on these issues, we have clear potential to improve residents’ lives, retain and attract jobs in the region, and ensure that those who live in East Multnomah County are able to access opportunity similarly to residents in the rest of the region. We are committed to working together with elected, business and community leaders to develop solutions that support balanced growth for a resilient economic future for East Multnomah County and for all those who live and work in our region. Andrew Hoan is the president and CEO of the Portland Business Alliance. 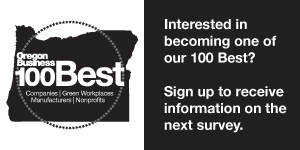 The Value of Jobs Economic Check-Up and Closer Look: East Multnomah County are produced by Portland Business Alliance in partnership with ECONorthwest.